Will millions of Christians be “raptured” and spared from a horrific period of time on Earth known as the tribulation? That’s a central theological question and point of debate among the faithful, with various faith leaders taking divergent stands on the eschatological time line. Christians who subscribe to dispensational premillennialism generally hold a belief in a future rapture event during which Christians will simultaneously leave Earth and ascend to heaven before the chaos of a seven-year tribulation period unfolds; it concludes, adherents claim, with the second coming of Christ. 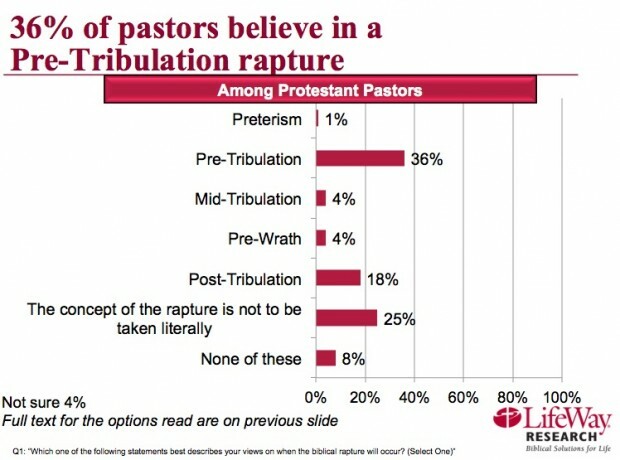 Overall, 36 percent of pastors — the largest proportion by far — aligned themselves with the pre-tribulation view, with the second largest proportion (25 percent) saying that “the concept of the rapture is not to be taken literally.” An additional 18 percent aligned themselves with the post-tribulation belief that the rapture and the second coming of Christ are essentially one in the same.